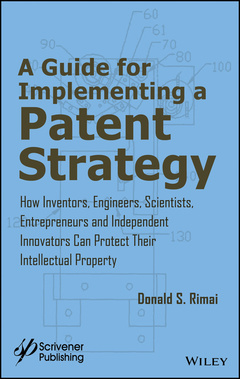 A Guide for Implementing a Patent Strategy Rimai Donald S.
Auteur : Rimai Donald S.
This book is aimed at the innovators who drive the advances from which we all benefit. This includes scientists, engineers, technicians, managers, and entrepreneurs who want to financially benefit from their innovations. The book describes how to build patent portfolios that will properly protect your technology and be of financial benefit. The tools that innovators need to have to generate patents are presented in detail. Donald S. Rimai recently retired from Eastman Kodak where he worked as a researcher and intellectual property manager in digital printing and adhesion science. He is expert at developing patent portfolios and helping inventors patent their inventions. He is an Eastman Kodak Distinguished Inventor with more than 150 U.S. patents and over 120 scientific publications. He is a Fellow of the Adhesion Society and of the American Physical Society, and has won the Charles Ives and Chester Carlson Awards. In 2014 Dr. Rimai received the Inventor of the Year Award from the Rochester Intellectual Property Law Association. He is the author of "Patent Engineering: A Guide to Building a Valuable Patent Portfolio" (Wiley-Scrivener 2016).